Carlton skipper Rory McCann hailed the way opening bowlers Tom Freshwater and Ryan McCloy put the Mazars Grange batsmen under pressure from ball one as the visitors secured an impressive CSL Eastern Premiership derby win on Saturday. The Grange Loan men made the trip to Stockbridge sitting third in the league table and smarting from two defeats by their old rivals earlier in the summer. Grange were sitting top at the start of play, but now Arbroath are in the driving seat to win the trophy on August 22 after Andrew Brock’s men were outplayed by Carlton. Having won the toss Irish international McCann, standing in for the injured Gordon Drummond, decided to bowl and Australians Freshwater and McCloy were on form straight away. Freshwater got the wicket of Caiden Lang for three and then McCloy snapped up the key scalp of George Munsey for 23 as Grange fell to 42-2. The Carlton duo took heart from that good start and Ali Evans and Chayank Gosain got in on the act as the quartet ripped through the home batting line-up. By the time Grange were 105-9 – vice-captain Ryan Flannigan top scoring with 29 – McCloy had three wickets and Freshwater, Evans and teenager Gosain had two apiece. Former Carlton man Harris Aslam and John Blain dug in for a last wicket partnership of 35 before the former was out to Freshwater for 21 as Grange were 140 all out. In their reply, Carlton’s batsmen showed great intent from the off, Fraser Watts and McCloy putting 66 runs on for the first wicket. After McCloy and Hamish Gardiner were out, Watts (42 not out) and Preston Mommsen (50 not out) saw their team home by eight wickets. A delighted McCann said: “I thought the bowlers were brilliant, the way Tom and Ryan started set us up for the day. “We knew how dangerous some of the Grange batsmen could be if they got in and settled, but we never let them and the rest of the fielders backed up the bowlers with some good work. “When we went out to bowl we thought that perhaps 220 or 230 would be a par score, so to bowl out the leaders for just 140 showed how well we played. “I wanted the batsmen to go out and attack the bad ball from the off and the way Fraser and Ryan batted was just what I was after. “We had a wobble, but Preston came in and showed his quality and I could not really of asked for more from the guys. 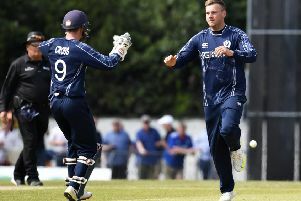 Elsewhere in the top flight, Watsonians made it four wins in a row after a cracking run chase against Autoecosse Forfarshire. Batting first, the visitors to Myreside made 284-7, captain Craig Wallace smashing 128 and Brendan O’Connell picking up five wickets. In reply Andrew-Fraser-Harris led the way with 83 not out and Andrew Chalmers made 82 as the Capital men won in the last over. Heriot’s lost to new leaders Arbroath by 166-runs at Goldenacre while RH Corstorphine were relegated after a 46-run loss at home to Aberdeenshire. In the Baillie Gifford ESCA Championship, SMRH lost to Glenrothes as the latter won the title. Kyle Macpherson scored 130 not out as Carlton II defeated Marchmont while Mazars Grange II beat Murrayfield DAFS and Stuart&Stuart Penicuik lost at Freuchie. At Campbell Park there was late drama as Edinburgh and Holy Cross tied, both sides posting 125 all out.